A 1000-year-old Grade 1 listed Manor House on the edge of the Surrey Hills, an Area of Outstanding Natural Beauty. 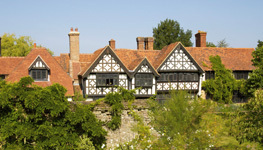 Great Tangley Manor is a truly historic venue in Surrey with luxurious accommodation. The Manor is a large private residence which is available for exclusive use, for up to 12 guests, and provides a beautiful environment for special events. Our extensive Victorian gardens set in three acres of grounds are fully maintained and offer the perfect escape from the stresses of day to day life. 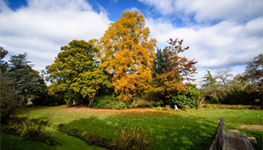 We provide seclusion and tranquillity within easy reach of excellent local amenities and less than an hour from London. 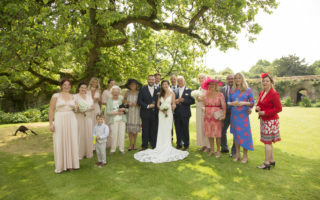 NEW - We are now offering Weddings here at Great Tangley Manor! Create your perfect wedding here at Great Tangley Manor and make the most of our beautiful grounds. Each bedroom has its own distinctive style and is comfortably furnished with either a 6ft double bed or twin beds, of which two can be combined with zip-and-link mattresses, plenty of wardrobe space and a seating area for relaxing. I booked Great Tangley Manor for a family get together for my birthday. Just wonderful. Beautiful inside and out, and full of history. The bedrooms are roomy and comfortable. Great spaces for eating and relaxing. The heated pool was a source of pure joy! I highly recommend Great Tangley Manor. A fantastic house and a unique experience. We were a group of 6 adults and 3 children and everybody loved every minute of it. Great Tangley Manor was a fantastic location for our family celebration, luxurious, historic and so homely. We all felt so relaxed during our weekend and enjoyed the wonderful grounds, tennis and swimming pool all nestled in the tranquility of the Surrey Hills. The house is very well equipped and we wanted for nothing during the weekend. The rooms are full of character and the beautiful dining room was perfect for our family celebration. From the moment we enquired about the property the help and service offered by Nicho was exemplary and nothing was too much trouble for him. We will definitely be returning! A great place to spend a weekend with friends! This highly historic house is well equipped, clean and warm. A gem in fact! The Pool is lovely too. Great walking straight from the door as well as a good pub within walking distance. We wanted somewhere near to my daughter’s where we could have a surprise weekend birthday celebration. Great Tangley turned out to be perfect. Although only a short distance from Guildford it feels like another world and how we hated having to leave. Other reviewers have summed up what the place has to offer and I would say that it pretty much lacks for nothing. We are left with wonderful memories and a desire to come back one day if we can. Together with a small group of our closest friends we hired Great Tangley Manor for the Bank Holiday weekend to celebrate our 70th birthdays. Our stay there was everything I wished for and more in this thousand year old house in a wonderful setting. We explored the beautiful grounds, had a BBQ in the centre courtyard, and on the Sunday had a chef in to cook us a 9-course Tasting Menu and a butler to serve it & keep our glasses topped up. On the Saturday we had a few extra friends join us at The Grantley Arms for dinner in their private dining room & also had a great evening. We made the most wonderful memories & will talk about it for years. 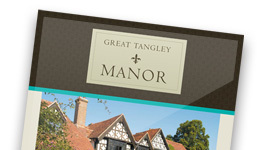 I wholeheartedly recommend Great Tangley Manor ……lovely owners & helpful manager. Booked for two nights for my daughter’s Hen Weekend for a group of twelve hens. The house is set in magnificent grounds which are very well maintained. The manager, Nicho, gave us a tour around showing us the extensive facilities and explaining the fascinating history of the place. He had even unpacked our online shopping delivery. The kitchen has everything you need and the reception rooms are very grand. The bedrooms are spacious and the beds very comfortable. There are 2 bathrooms upstairs in the main house, but only 1 small shower potentially between 8 people! The annex bedrooms, in contrast, share a much more modern bathroom with a large shower. The large TV in the library is very old and needs updating as it didn’t have the USB connection we needed (and had been assured was there) for some of our games. Disaster! Could also do with a decent Bluetooth sound system or at least an iPod dock! Overall a wonderful place but the technology requires some updating, along with the bathroom facilities. Would thoroughly recommend using this lovely place for special events. We stayed for a long weekend at the beginning of February to celebrate a 50th Birthday. We were extremely excited about having the pleasure of sharing this historical family home & having the opportunity to experience life in such a beautiful place….& we weren’t disappointed! The manor was very well equipped for self catering & the eleven of us felt very comfortable and at home. The pool was the perfect temperature & a super size. Unfortunately we didn’t have time to play tennis or croquet. Guildford is a short drive away & there are some nice local walks. To be quite honest, we ran out of time to go exploring too far as we just enjoyed spending time together at Tangley. We had a wonderful 20’s themed fancy dress murder mystery party on Saturday evening and the dark wood panelled dining room was the perfect setting for it. Thank you so much Nico for keeping shtum about the surprise family visitor from Australia! Many many thanks to the family for allowing us to share your beautiful Manor. Great Tangley Manor was absolutely stunning. The pictures don’t quite do it justice. We didn’t want to leave because it was such a joy to be in the place. In addition, having a tennis court, swimming pool and other games at hand meant there was always something to do. All with your own private pond with ducks and other birds. Nicho was a pleasure to deal with. We recently had the pleasure of spending a weekend at this amazing property – it was perfect! We were 10 friends that decided to go somewhere special and our choice could not have been better. We loved the gardens, the moat, and every inch of the fabulous house. The kitchen and dining room is well equipped and perfect for entertaining.The property manager provided superb customer service – every question answered and all our needs catered for. I would recommend this very reasonably priced property as a fantastic getaway for anyone, and I can’t wait to go there myself again. Tangley Manor is a fabulous venue for you whether it be for a quiet retreat or an amazing Party venue as I used it for as a group of 10. 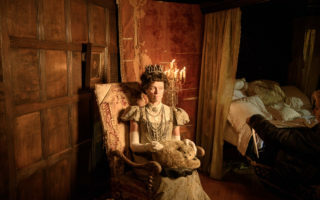 The rooms are beautiful and the whole Manor is spotless I couldn’t fault it. I stayed at Tangley for a 3 day weekend, the first evening we had a BBQ party in the courtyard, noise isn’t really a problem we had the music quite loud and from outside of the house you couldn’t hear a thing. We are already planning our next weekend at Tangley. Thank you to Nicho especially for all his help. We had a fantastic weekend at Tangley Manor and it was a great venue for relaxing with a group of friends. The house had so much character and there was plenty of room for the 12 of us (6 adults and 6 children). The property is well maintained and was also very clean throughout. The kitchen is well equipped and the coffee maker was appreciated – especially first thing in the morning! The bedrooms were amazing, each one was unique and the beds were very comfortable. The website provides an accurate description of the house and facilities, but it really doesn’t do justice to what a fantastic place it is. Exactly as described on their web site, the property is a delightful mix of historic manor with modern additions, set in secluded gardens. The quirky and historic nature of the main building certainly give it the edge over previous weekend rentals. It is furnished to a very high standard throughout. The (modern) kitchen is particularly well equipped and has a large range-style cooker to facilitate a larger group. The striking all-glass extension gives a great place to congregate, overlooking the central courtyard. Ours was a short stay with a group of friends to celebrate birthdays. We had a fabulous time and didn’t feel at all impeded by the owners living next door. The owners were at all times helpful and welcoming. Having stayed at Great Tangley before, I was looking for an excuse to come back. I am pleased to say that second time round, it did not disappoint. 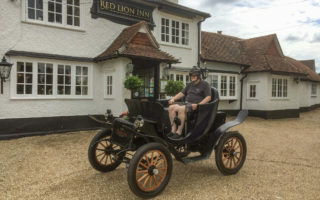 It is a beautiful building, steeped in history, set in magnificent grounds and nestling on the edge of the Surrey Downs, with the requisite number of cosy country pubs in striking distance. The accommodation is immaculate and equipped with an excellent kitchen, perfect for catering for large groups, and a suitably regal dining room in which to savour the fruits of your labours. It is ideal for larger groups of ten or more, as there is plenty of room and ample diversions for a weekend at a leisurely pace. 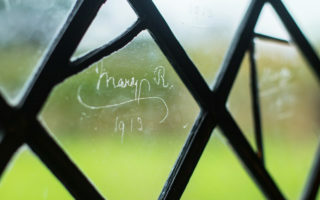 Seek out the signatures of kings etched on the windows, wander the walking routes that criss-cross the Downs on the doorstep, curl up in a comfy armchair in the Arts and Crafts sitting room, feed the fish in the courtyard pond, and marvel at the most outlandish listed bathroom you will have ever had occasion to witness. We arrived at Great Tangley in the dark so I didn’t really see the outside on arrival. But when I walked in the front door it certainly had the wow factor. It was spotlessly clean and had so much space. The house was decorated to a really high standard. The Kitchen and Conservatory were modern and had everything you needed to cook up a storm. Eating in the huge oak paneled dining room was a real treat. Bedrooms were huge and beautifully finished. The next day I got to see Great Tangley in day light. The gardens were immaculately kept and the moat around the house was fantastic! I would definitely like to stay here again. One of the best parts is it was only 40 mins by train from central London – yet it feels a different world. The house was a dream come true for us – we had a special, memorable time there. The house was very comfortable, the gardens exceptional and the country-side spectacular. The staff and owners made us feel very welcome and helped in making our family reunion a very special occasion. Grandparents, 2 Children, 2 Children-in-Law and 4 Grandchildren spent a long weekend celebrating in this wonderful setting. They were joined by 30 friends and relatives from noon on the Sunday. The house and gardens more than lived up to our expectations, the management was most helpful – nothing being any problem – and the weather smiled on us. Caterers recommended by Great Tangley could not have been bettered and even the pub lunch at the nearby Percy Arms proved delightful. A weekend and a superb venue to be very long in the memory. Great Tangley Manor could not be more highly recommended for something very special. Nicho, the manager, is very pleasant, readily available and helpful with preparation for the visit such as offering information and receiving grocery deliveries. On arrival we were greeted with a welcome sign which was a nice touch. The house more than met expectations, beautiful. The decor was charming and the house very spacious, sufficiently so for large parties to have their own space as and when required. The grounds and country walks were lovely. The pool access due to snow wasn’t the easiest as the ground was slippery and it was a bit of a walk – once in it was very much enjoyed. The kitchen was well stocked with pots, pans, crockery and cutlery and the glass extension a lovely place to eat. All-in-all a lovely stay enjoyed by all. It was the perfect venue for a corporate retreat. Near to London, total privacy, comfortable and well appointed common areas for group meetings, lovely bedrooms, and beautiful grounds. It was exactly what we were after and I would recommend it highly.